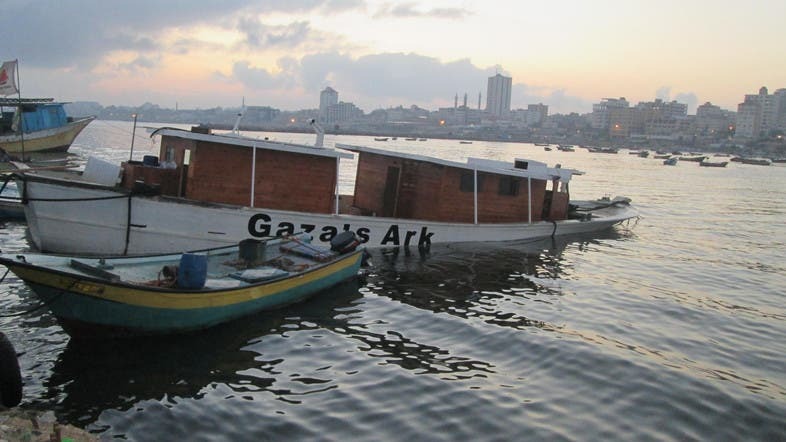 Gaza's Ark, a Palestinian-built protest boat which was preparing to run Israel's naval blockade of the territory, was badly damaged in an explosion on Tuesday that organizers blamed on Israel. The blast in Gaza City port struck at around 3:45 am (00045 GMT) and was preceded by an anonymous telephone call warning the guard that the vessel was about to be blown up, organisers said. The ship, a large fishing vessel which was being readied to put to sea in June, sustained major damage and sunk in the shallow waters of the port, leaving three-quarters of it submerged. "An anonymous caller phoned the guard and told him to leave because they were planning to destroy the boat. He was very afraid and ran away," project manager Mahfouz Kabariti told AFP. He said the guard escaped unhurt as he was about 200 metres (yards) away when the explosion struck. "We blame Israel because we have had very bad experiences with them in the past when they destroyed several solidarity boats," he said. He was referring to an incident in 2011 when two boats docked in Greece were mysteriously damaged ahead of an attempt to break the Gaza blockade that organisers blamed on Israeli "sabotage." "We are convinced Israel did it because we were preparing for a test run next week, with the main voyage planned for June 15." He said all the details had been given to Gaza's Hamas-run police force who had opened an investigation. Mustafa Abu Awad, the 25-year-old guard who was on duty at the time, told AFP he had been warned to leave the area by an anonymous caller. "I was sleeping near the boat and someone phoned me -- an unidentified caller. I answered and he told me: 'Mustafa, leave the boat right now because we are going to blow it up.' I asked him who he was, but he hung up." Palestinian labourers and foreign activists have been working for more than a year to fit out the boat to carry goods and more than 100 passengers in the latest high-profile attempt to challenge Israel's maritime lockdown on the tiny Hamas-run territory. If successful, it would be the first time goods from Gaza have been exported by sea since the signing of the 1994 Oslo peace accords. Under its current restrictions, Israel does not allow Gaza fishermen to venture more than six nautical miles from shore, and its naval patrol boats have been known to fire on those who stray beyond. "Gaza's Ark and all our partners in the Freedom Flotilla Coalition are considering our next move in response to this cowardly act of terrorism," said steering committee member David Heap. "But our position remains clear -- neither this nor any other attack will stop our efforts to challenge the blockade of Gaza until it ends." Fellow committee member Ehab Lotayef echoed his comments. "Freedom Flotilla boats have been sabotaged before... You can sink a boat but you can't sink a movement."